"Don't speak American business if you not from here," Waka tells Daniel Caesar. 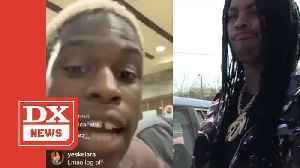 When Daniel Caesar stood up for social media influencer YesJulz’s perceived disrespect of black women by asking why black people are being “so mean” to white folks during his Instagram livestream..
Caesar the dog was very excited to see his friend Zombie the white white dog when his owner took him outside for a walk. Hilariously, Caesar ran too fast causing him to pull on his leash and his owner..